Elisabeth Young admits that she was never a great employee, as she was easily frustrated by unnecessary inefficiencies. Such frustration was a big factor in why she quit her corporate job and started working for herself creating custom wedding invitations. Initially, Elisabeth was excited to launch a new creative career. But, as many entrepreneurs have experienced first-hand, Elisabeth’s unquenchable passion for her business was almost squashed flat by the tough reality of working by herself day after day. Elisabeth opens up about her struggles with depression and anxiety during her first year of business and how she learned to cope and to heal. We appreciate her candid conversation about a sensitive topic. We hope others in our QB Community read this post and remember that they, like Elisabeth, are not alone in experiencing the ups and downs of running a business. Elisabeth, tell us how you decided to take the leap from working for someone else to working for yourself? I was working full time in a real estate office. I knew at a certain point that I wouldn't be able to grow my side business more unless I gave it 100%. I also didn't like my job very much, so that made it easy to put in my two weeks’ notice and make the transition to working for myself full time. What made moving from side hustle to full-time business owner so important? Honestly, I’m not a good employee. I was not great at working for other people because I'm very, very efficient, so if I felt like something wasn't efficient enough in a corporate work environment, it would really frustrate me. I knew that since I had this passion and this fire burning, I wouldn’t be totally fulfilled unless I was doing something for myself, using my self motivation and reaping the reward that comes from that. What was your first year working for yourself like? Year one had so many incredible ups, but I also experienced the lowest of lows. Such a big part of being a small business owner is the state of your mental health, and people don't talk about that very much. When you work from home, you can get really lonely because you’re spending a lot of time alone. You really have to be intentional about searching for community and for connections and making sure you get out of your house. How did that first year of working for yourself affect your mental health? I had a really bad bout with anxiety and depression about halfway through my first year of business because I was shouldering so much responsibility. I was the solopreneur, the creative heart and soul of the business. I was wearing all these hats and doing all these different things. I would have moments when I felt very victorious and very successful. Other moments, the pendulum would swing the other way. I’d panic and think, "I have no idea what I'm doing. Why am I doing this?" I feel like it's never totally balanced, but it makes the journey fun and makes it an adventure, for sure. Thank you for acknowledging the loneliness of running your own business. It was a tough time for you. When did you know you needed support -- and how did you get it? I didn't have enough self-awareness at the time to realize I was heading down that path until I was already there. I was sitting at home, and even though I’m married and have two cats, as well as other people I know from church and in the community, I just felt this pit of loneliness and despair. It was scary to be there and not understand how I'd even reached that point. From that time on, I had a lot of discussions with my husband and my friends saying, "I need your help." I asked my other creative friends, "Have you dealt with this before? How did you handle it?" I had some really hard months. In terms of productivity for my business, it was pretty low, because I was trying to do a lot of personal recovery. I spent a lot of time away from Instagram, away from Facebook and away from all these social media avenues because I needed to focus on myself and stay in my lane. I needed to focus on myself and get better. How did “staying in your lane” help improve your mental health? When you have a vision of what you want to do, you really have to put your blinders on. In your work, you might be 100 or 200 in a million because other people share your ideas and passions. You can be friends with those people, and you can admire their work. The problem is when you start getting that longing in your heart like, "I wish I had thought of this" or "Oh, I wish I had done that." That's when things can become really damaging emotionally. Staying in your lane is kind of like putting on your blinders, pursuing your goals and tuning out the noise. I’ve heard that you love to-do lists. Is that a tool you use to keep focused? Yes. I remember the first two weeks of working for myself. I was sitting at home at my desk, and I realized I didn't have anybody telling me what I should be doing. I didn't have a boss. I had myself, and I needed to be making work for myself. You're told your whole life, "Don't make things harder on yourself. Don't make more work for yourself." I had to entirely flip that whole perception. I had to make work for myself, and that meant making to-do lists. I had to know every single day what my priorities were and what I needed to accomplish to consider it a successful day. The lists help me keep myself on track towards my goals and to meet my deadlines on time for my clients. I want to circle back to this idea of loneliness. Is it because there aren't other co-workers around or is it because you have to make all the decisions on your own? That's such a thought-provoking question. Actually, I don't think I've ever come at it from that viewpoint before. I think there is loneliness within the business because I don't have a coworker or a peer to help shoulder the responsibilities with me. I think a lot of the emotional loneliness can stem from that, too. The other interesting thing is that I'm an introvert. I went into this thinking, "Oh, I'll never deal with loneliness. I don't need people. I prefer my pets." I quickly realized I'm still human. I still need connection with people. The loneliness does come a bit from being a solopreneur -- I’m the boss of my business and the only person in my business. There’s also the element of being physically alone in my workspace. Elisabeth, I really commend you for talking about the challenges of loneliness as an entrepreneur. We have these conversations every day in this community. The more we talk about it, the less lonely we'll all feel. Please remember that you’re not alone! QB Community members, how do you deal with the loneliness, stress and/or anxiety that inevitably comes with running your own business? Thank you so much Elisabeth for sharing your raw truth. I can completely understand the depression as well as the anxiety. I especially can relate to the "making work for myself" as well at the being married, although I have two children and a dog. However, that loneliness can be overwhelming when the kids are in school, the husband is at work. And you have no one to chit chat with or no one that you can befriend. This QB Community has become extremely helpful and important to me because it gives me a sense of belonging and I can check it no matter the time or day. In addition, it has provided me the courage to step out: join different professional groups, attend live events to meet "real people"and volunteer at different community events. I am keenly attentive to my mental health as some of my family members have had battles with mental health. I have also loss two brothers to suicide (2009 and 2016). So I do mental health checkups for myself REGULARLY. I think that it is important to note that although solopreneur is exciting and we do experience the ups and downs being mindful of our mental state, understanding when and if we need to back away is vital to our business. Especially since, as you have already noted one can have a really great week or months and then it can really be low. It is all about finding the balance. Once we have learned to be great jugglers we soar. I am a volunteer/advocate for suicide prevention awarenss and I tell everyone I come in contact with "YOU ARE NOT ALONE"; find your tribe. Embrace your tribe. I love this, @QcFinancial. One of the most challenging (and also empowering) things about working for yourself is that YOU are the decisionmaker - you and you alone. It can be hard to make all those important decisions in a vacuum with no one to bounce ideas around with. 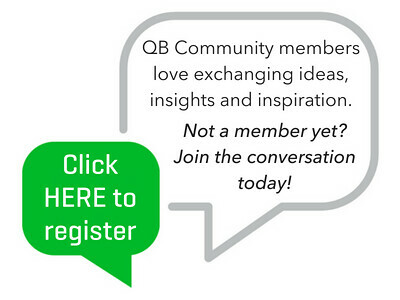 I'm so glad to hear that QB Community has provided some support for you - that's exactly why we're here! p.s. I'm sorry to hear of the loss of your brothers, and thank you for all your important work in suicide prevention My mom worked for many years as a social worker helping people with mental health issues, some of whom became a real part of our lives. It's something that touched me very deeply. Thank you for sharing @QcFinancial. It's so important to tell these stories so others know that they aren't the only people who may struggle. As entrepreneurs, we bring our whole hearts and souls to work so it's not easy to compartmentalize because we ARE our brand. I'm thinking about Kate Spade, how she feared if she was open about her depression and anxiety that it would tarnish her happy-go-lucky brand. Such a tragedy and all the more reason to have these ongoing discussions. Thank your mother for her work as well. We must continue to spread love and joy, as well as be our true, full, transparent selves, ALWAYS. I'm sharing an article via @LeslieBarber on the psychological toll building a business can take on a person. In light of the recent suicides of two prominent and beloved entrepreneurs, it seems a great time to reflect on our own mental wellness and to check in with our friends who seemed stressed, have a lot going on in their lives or simply because we want them to know that we care about them. "Lately, more entrepreneurs have begun speaking out about their internal struggles in an attempt to combat the stigma on depression and anxiety that makes it hard for sufferers to seek help. In a deeply personal post called "When Death Feels Like a Good Option," Ben Huh, the CEO of the Cheezburger Network humor websites, wrote about his suicidal thoughts following a failed startup in 2001. Sean Percival, a former MySpace vice president and co-founder of the children's clothing startup Wittlebee, penned a piece called "When It's Not All Good, Ask for Help" on his website. "I was to the edge and back a few times this past year with my business and own depression," he wrote. "If you're about to lose it, please contact me." (Percival now urges distressed entrepreneurs to seek professional help: Call the National Suicide Prevention Lifeline at 1-800-273-8255.)"